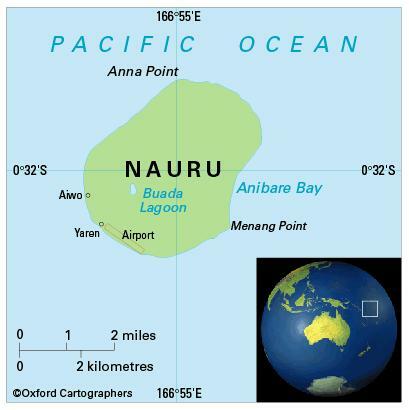 Nauru is a small oval-shaped island in the western Pacific Ocean. Climate: The climate is tropical, with sea breezes. North-east trade winds blow from March to October. Day temperatures range from 24 to 34°C; average humidity is 80 per cent. Rainfall is erratic and often heavy; average annual rainfall is 2,060 mm. The monsoon season is November to February. With the destruction of the forested areas on the plateau land to enable phosphate mining, climate changes have been noted with extensive dry periods. If global warming causes sea levels to rise, the habitable low-lying land areas will be at risk from tidal surges and flooding. The most significant environmental issues are devastation of some 90 per cent of the island by intensive phosphate mining during most of the 20th century, and dependence on an ageing desalination plant and collection of limited rainwater for water supply. 10,000 (2012); 100 per cent of people live in urban areas. The population growth rate stood at 0.4 per cent p.a. 1990-2012. The birth rate is approximately 27 per 1,000 people (est) and life expectancy at 66 years (est). The indigenous people of Nauru are Micronesians. Increased population since the 1960s has put extreme pressure on the coastal fringe surrounding the island, which is currently the only space available for housing. Nauru is classified as a lower-middle-income economy by the World Bank.